IN LIKE A LION – OUT LIKE A LAMB? 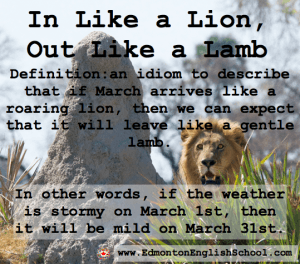 This idiom means that if March comes in (arrives) like a roaring lion, then we can expect that it will go out (leave) like a gentle lamb. In other words, if the weather is cold or stormy on March 1st, then it will be mild on March 31st. And then, the opposite is also said to be true. If the weather on March 1st is nice, then the weather on March 31st is sure to be terrible. I don’t think there is any scientific evidence behind this old idiom. Perhaps all it does is remind us that the weather in Canada, especially in March, often goes from one extreme to the other.